So, you have no doubt seen my praise for 2-player starter sets for miniatures games. I got into minis games with a 2-player starter set, splitting it with my friend. But what if you've got more people wanting to get into a game? Sure, if there's 4 of you, you could just get two starter sets. But Warploque Miniatures thinks that's kinda lame. As such, they've got a 4-player starter set in the works for ArcWorlde. It's the Battle For Troll Bridge set and it's up on Kickstarter now. So what comes in the set? 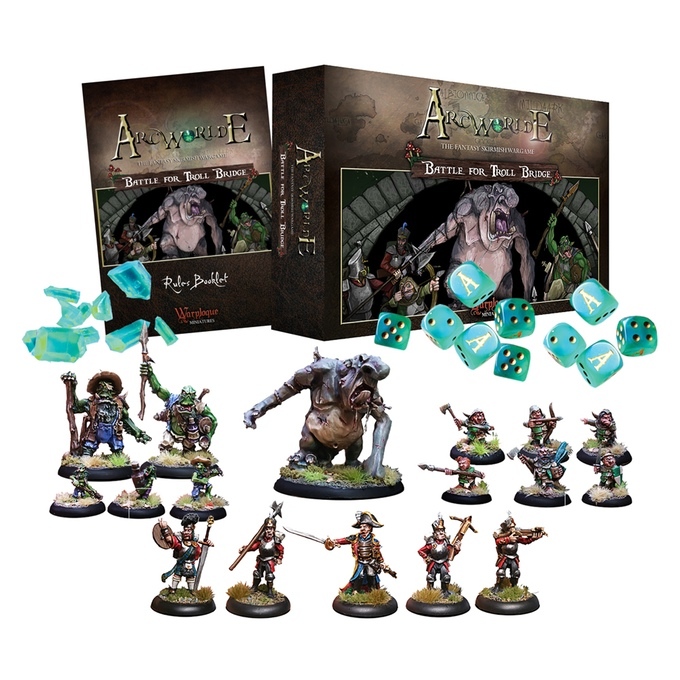 Well, you've got five new Albionnican Empire figures, six new Halfling miniatures, five new Bayourk figures, and the massive River Troll (can't really call it "Troll Bridge" without a troll in it, can you?). You also get 10 ArcWorlde dice and 10 Arcanite tokens. There's also a 20-page rulebook with quick-start rules for the game, plus scenarios for you to try out. The campaign's only running for 10 days, total. So you'd better get in on it now. The campaign is more than 2x funded and working on stretch goals.